Harvard President Drew Faust and Boston Mayor Martin J. Walsh were on hand at the groundbreaking ceremony on Monday that marked the upcoming renovation of the historic William F. Smith Field in Allston. The $6.5 million renovation will include improvements to the playground and sports fields, new walking paths, a splash pond, a street hockey court, and a spacious amphitheater where performances can be staged year-round. Plans also call for increased opportunities to display public art, as well as for several street improvements along Western Avenue. Harvard continues to be a strong partner in helping advance Walsh’s commitment to creating and maintaining world-class parks, as well as his plans for encouraging creative uses for public space. 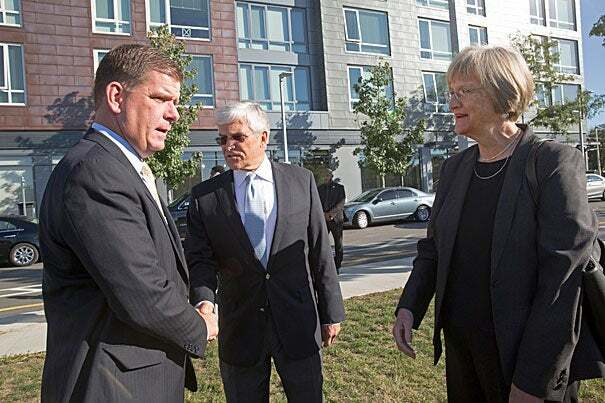 Echoing Faust’s statements, Walsh said, “Parks and green spaces are gems in our communities. Whether residents use it for a game of soccer, a quiet place to take a walk or study, or see a performance at the amphitheater, I have no doubt that Smith Field will be treasured by all those in Allston. The community, the city, and Harvard deemed the renovation of Smith Field a high priority during the 2013 Institutional Master Plan (IMP) and community benefits master planning process. 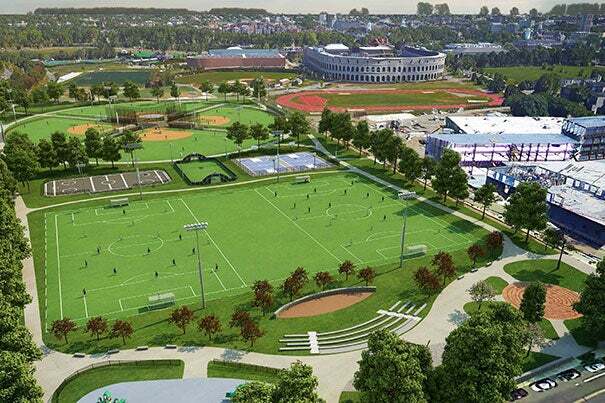 At the same time, the city of Boston approved a significant capital expense to fund a Smith Field master planning process and a $3.3 million renovation. The regulatory approval for the Continuum project also included $500,000 in community benefits to improve the field. The Boston Parks and Recreation Department launched a public master planning process in 2015, which included a comprehensive series of public meetings to refine the scope, design, and cost of the project. The Harvard-Allston Public Realm Flexible Fund approved $185,000 to expand the scope of the first phase of the project and pay for its design. In March 2016, the Flexible Fund approved $1.9 million to fully fund the first phase of construction, which will renovate two-thirds of the park. Harvard contributed an additional $700,000 to implement a connective pathway network (known as Longfellow Path) around the edges of the park, fulfilling a community benefit commitment associated with the 2008 Science Cooperation Agreement. The Public Realm Flexible Fund Executive Committee is responsible for developing and administering the public process associated with the distribution of Harvard’s $5.35 million local grant program. The grants are directed to community groups for improvements to the public realm. In 2016, the Boston Parks Commission voted to name the new amphitheater for Maj. Gen. George Casey, an Allston native and war hero who died while in service in Vietnam. Casey’s son, George Casey Jr., a retired U.S. Army general who served as the commanding general of the Multinational Force-Iraq from 2004–2007, and as the 36th chief of staff to the U.S. Army 2007–2011, was on hand for the ceremony. “Maj. Gen. Casey lived a life of heroic service and complete and unconditional sacrifice. The 14-acre park was established in the 1890s and is named for William F. Smith, who was killed during World War I. It is located on Western Avenue, across from the Harvard Ed Portal and adjacent to the Continuum building at Barry’s Corner, and has long been a community cornerstone.